When I saw this film in Japan, the first thing I noticed was that nearly every single actor had a familiar face. Japanese actors are in many ways busier than their Western counter-parts. Among most actors’ duties are not only to act in movies, but also to appear in as many various commercials, talk-shows, game shows, television dramas and magazines as humanly possible. When an actor/actress is hot in Japan, you can quite easily see her face anywhere. The summer I saw this film, it was not uncommon to see different commercials back to back featuring at least one of the actors found in “The Magic Hour.” Whether or not you can recognize the celebrity cast of “The Magic Hour” is irrelevant to enjoying the film. Like “Anchorman” you don’t have to be familiar with the actors to laugh, and like “Anchorman” if you do recognize the actors you will not be distracted. 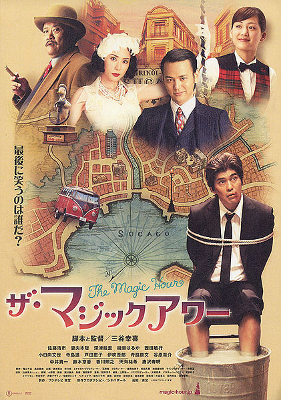 The actors of “Magic Hour” do their roles well, most memorably Koichi Sato and Toshiyuki Nishida. But what allows these actors to excel in this film is not just their ability or synergy with the cast, but also the brilliant and original plot. A hotel manager (Satoshi Tsumabuki) is doomed to die after he is found out for having an affair with the beautiful wife (Eri Fukatsu) of the local mob-boss (Toshiyuki Nishida). To save his own life, he promises to find Dela Togashi, despite not knowing who or where he is. Upon discovering that Togashi is the Phantom Assasin, Japan’s #1 sniper, the manager decides to hire an unsuccessful actor (Koichi Sato) to pretend to be the killer. To keep his actor unaware that these situations are real, the manager creates the illusion that they are producing a mafia film, done in an improvisational style. The results are hilarious. In conclusion, this film is hilarious, creative and fresh. While a bit too long, this is a memorable comedy.